The interview below is with Dean S Jagger but you can find Ben Jagger’s interview here. 1) When did you first begin acting? I always had a passionfrom an early age, call it what you will, I was acting out when I wasn’t evenacting, spent the time at school day dreaming thinking of it so didn’t get muchwork done at all, very boisterous, my brother for that matter too. But when Ileft school I auditioned and got into a local theatre company. I’ve had breaksin between the pursuit of my acting, but it really hit me hard one day when Iwas confronted with a decision, do I go study in LA or do I stay and grind itout… I’m proud to say that our writer and producer, Alistair Audsley, had asmall part to play in this. And of course I went; I was around the age of25. 2) Being involved in the film industry seems to bea family trait, how did you enjoy being directed by your brother? Yeah it’s starting tofeel that way. Me and Ben have a great dynamic, obviously being joined at thehip from such a young age we carry that through with us in our work, being ableto anticipate each other really helps when it comes to creating the characterand vision within the story. We pretty much finish each of our sentences offon a regular basis, so when it comes down to getting want he wants, I’m alreadyin his head space – as he is mine. Ben thought I’ll say this, he’s the hardestworker, a true grafter on set, he’s a leader. He’s an actor’s director forsure; he’s a tricky one, he’ll always have something up his sleeve and you’llbe like, why didn’t I think of that!? That’s his job I guess, the guy’s gotgame. 3) Could you tell us a bit more about your role inThe Paddy Lincoln Gang? McAlister is asambigious as he is talented, he’s the kind of person, and some of us have themin our life who you’ll think…actually I don’t feel like I know this guy, butwhy? He’s complicated, quite a paradox. He’s yearning for his shot, for hisband to break out big and his hunger for music is unquestionable but this iswhere the danger lies within him, as his passion is his obsession and the placethat he draws from creatively petrifies him, that’s his darkness, which we allhave to some degree. 4) What was it you wanted your character toportray? I wanted Rob to be theproduct of what many musicians have to go through whether they actually make itor not. Rob is a ‘without rules’ kind of character, his insecurities, his pain, his love, his passion, his obsessionall play their part in the unfolding of him in this film. 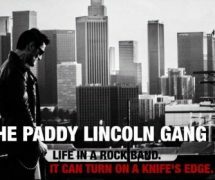 One of the mostinteresting and most shocking things I came to learn throughout the process ofcreating him and making The Paddy Lincoln Gang was learning that his charactertraits actually exist in other artists, artists of today and some of the greatsthat we sorely miss. Rob is a clear example of how one’s genius can destabilizethem. I have Alistair Audsley and Colin McGuinness, my music consultant for thefilm, to thank for this insight. 5) Do you have any advice for young people, lookingto pursue a similar career to yourself? Yeah, don’tmake plan B’s and burn every bridge you walk cross, that way there’s no goingback. Get after it! Hats off to you. 6) Is there anything else you would like to say toyour audience/viewers? Thank you for takingthe time for us, I wanna shout out to everybody who worked on the movie, I takemy hat off to each and every one of them. 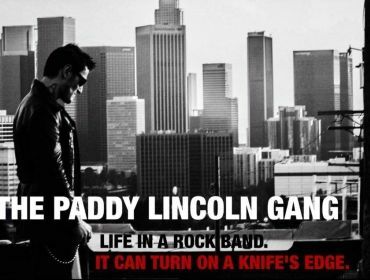 I hope The Paddy Lincoln Gang findsyou and leaves you with something to think about, it certainly did me.